A live trivia show hosted by Bruce Campbell in person! 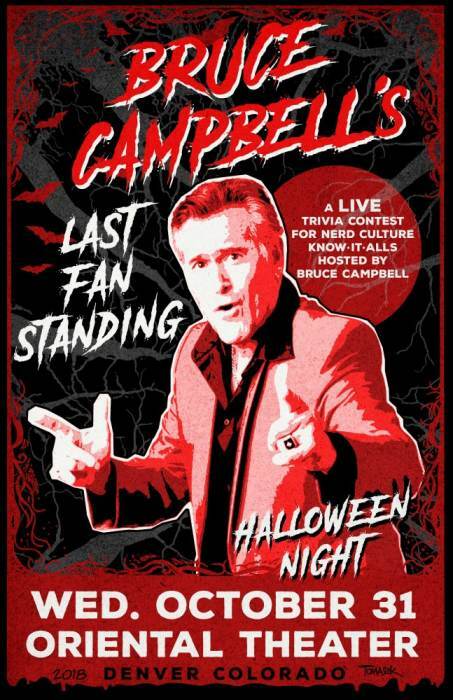 Bruce Campbell: Your Hero, our host. Well, he's our hero too! From his turn as Ash in the classic 80’s Evil Dead horror movie series, to his seven-seasons on Burn Notice, to the reprisal of his iconic character in Starz’ Ash vs. Evil Dead, Bruce Campbell has long been a fanboy favorite—and part of the braintrust behind Last Fan Standing. Not your average quiz show or trivia contest, Last Fan Standing tests your knowledge about the things that really matter. Brought to life through a dynamic and entertaining live event, Last Fan Standing is the ultimate test of pop culture and fandom. Last Fan Standing 2015 Sizzle from Red Forge Productions on Vimeo.